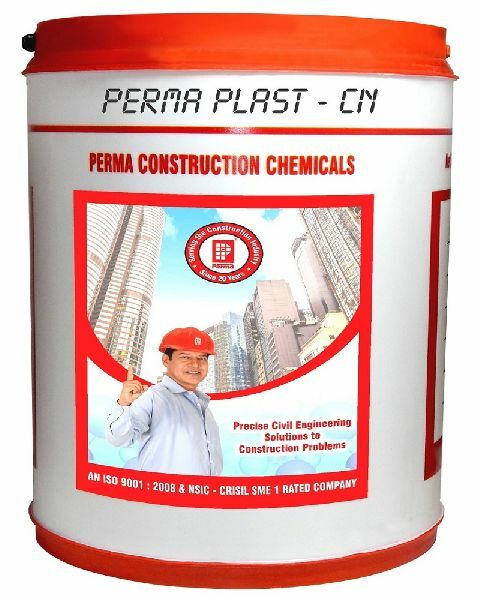 Perma Plast CN is a corrosion inhibiting admixture for reinforced cement concrete which protects the reinforcing steel in the concrete from corrosion. Porous concrete allows ingress of water and moisture in the RCC structures, which starts corroding the reinforcing steel thereby reducing the life of concrete member and the structure itself. An addition of Perma Plast CN in the concrete at the recommended dosage during construction itself ensures corrosion free reinforcing steel with its long life. We are the most trusted Manufacturer, Exporter and Supplier of the finest quality Perma Plast CN in the global market. We make avail the Perma Plast CN at very affordable prices. Advanteges : Perma Plast CN is a liquid which easily mixes with water hence can be dosed along with water. Perma Plast CN is compatible with all types of cements and with other admixtures. It is a VOC free product and hence safe for the environment. It is free from chlorides and sulphates and is non hazardous It increases the life of the structure by protecting the steel. Perma Plast CN does not affect the plastic properties of the concrete.